Based on the high request during our summer sale, we are happy to announce that the high-speed inkjet card printer SwiftColor SCC-4000D is again available under very favorable conditions. 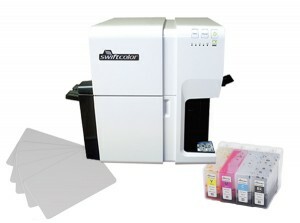 Take your chance and aquire one of the exclusive SCC-4000D bundles, including one card printer, 100 Xl plastic cards and a set of YMCK colour catridges. Purchase the special bundle for christmasey 4490,00€ (RRP: 7460,00€) and save 40% on the original price.